"Karina 43”x22” cast aluminum half round table in black tippet finish. An extraordinary new product for expanding your outdoor leisure living. The Karina practical design allows you the freedom to use your space your way. 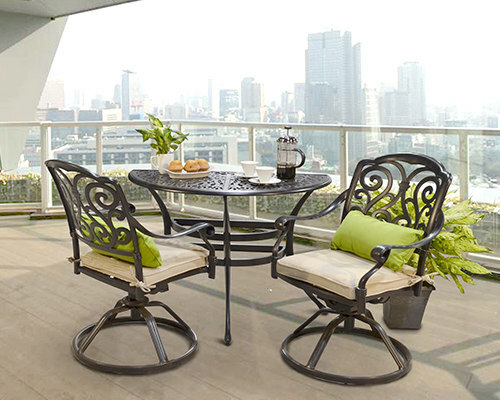 Enjoy more of your outdoor setting with this uniquely styled half round table. It provides the perfect addition to compliment your patio, deck or balcony. Our Karina collection of cast aluminum dining tables offers luxurious style for any setting, from palatial terraces to more intimate verandas. The Karina half round table is perfect as an outdoor patio dining table, as a console or server.